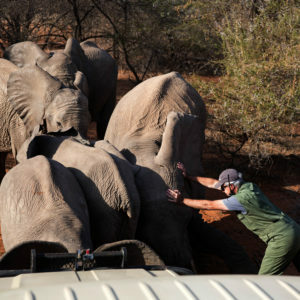 Since 2013, more than 4 200 animals have been translocated to Maputo Special Reserve through a multi-year rewilding project led by Peace Parks Foundation in support of Mozambique’s National Administration of Conservation Areas (ANAC). 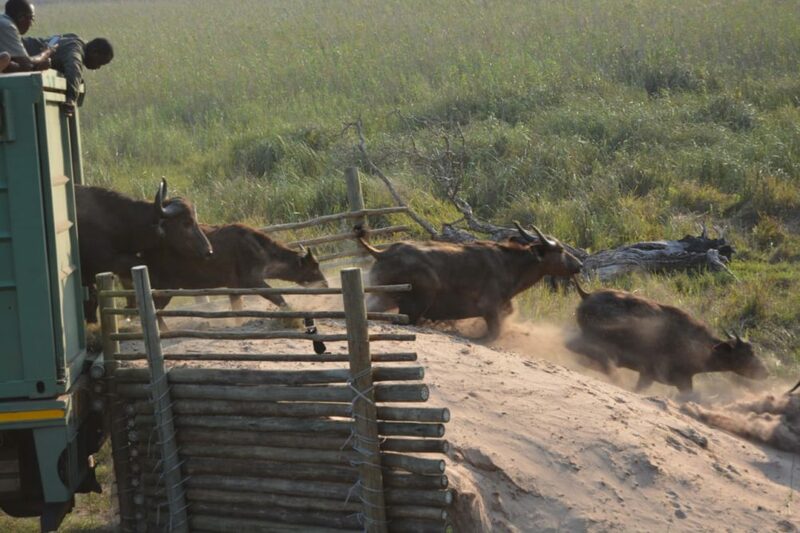 On Sunday 11 November 2018, Peace Parks released three more buffalo into the reserve, thereby concluding a busy translocation season that also included translocation of 630 animals to Mozambique’s Zinave National Park. For the past three years, operational funding for Maputo Special Reserve was secured through the COmON foundation and the Mozbio programme, which supports conservation and development of projects which include the enhancement of livelihoods of communities living adjacent to Maputo Special Reserve and Ponta do Ouro Partial Marine Reserve. Maputo Special Reserve lies within the Lubombo Transfrontier Conservation and Resource Area which stretches across the borders of Mozambique, South Africa and the Kingdom of eSwatini. It was proclaimed a protected area in 1932 with the primary aim of safeguarding coastal elephants. Although several years of civil war and severe droughts nearly eradicated all wildlife here, the combined efforts of the governments of Mozambique, The Kingdom of eSwatini and South Africa, as well as conservation agency Ezemvelo KZN Wildlife, Peace Parks Foundation and the World Bank, have seen the reserve’s animal populations revitalised. Species reintroduced over the past eight years include warthog, kudu, nyala and giraffe, as well as a variety of plains game such as impala, waterbuck, blue wildebeest and zebra, each having their own role to play in restoring the Maputo Special Reserve ecosystem. 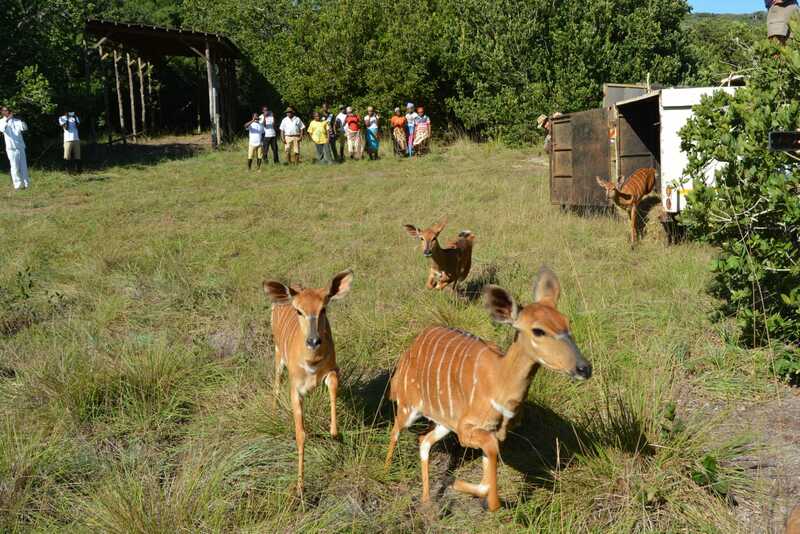 Local community members celebrate as Nyala are released into the Reserve. 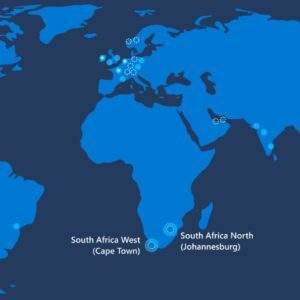 A project highlight was the introduction of 31 buffalo in 2017. Buffalo, one of the iconic big five, are a fascinating species. Apart from having strong social connections evident in the veracious manner in which they protect their very old and young from predators, and having a democratic system to determine in which direction the herd travels, as mega-herbivores African buffalo herds also contribute significantly to restoring unbalanced ecosystems. 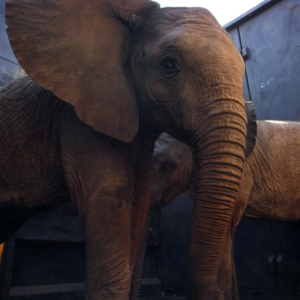 The three released on Sunday had been roaming freely in the cattle areas of local communities in Mozambique. As buffalo are notoriously aggressive and unpredictable, moving them into Maputo Special Reserve has reduced the risk of human-wildlife conflict. 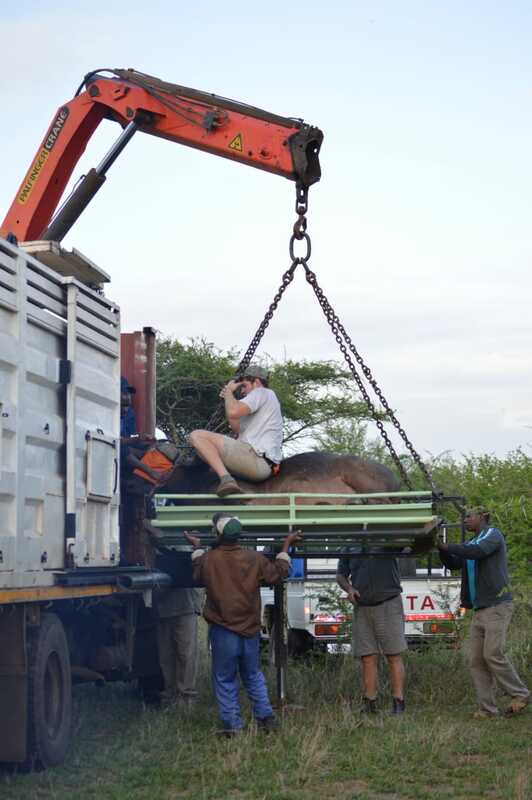 During 2018, buffalo were brought in from Tembe Elephant Park in South Africa. 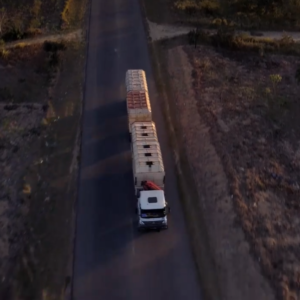 Because of growing animal populations, Tembe’s carrying capacity came under pressure resulting in 39 buffalo and 49 nyala being relocated to Maputo Special Reserve. In addition, the reserve received 95 zebra and 20 impala from South Africa this year, which further boosted game numbers. 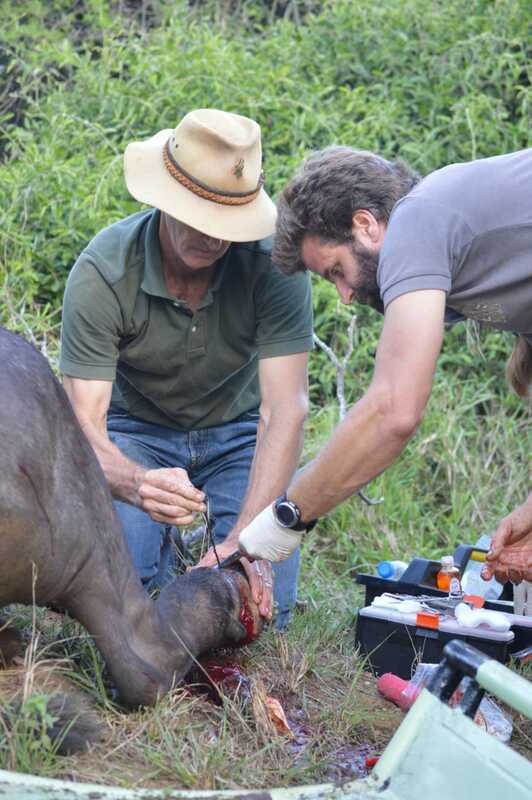 With veterinary support from Joao Almeida who is supported by Saving the Survivors, the animals were darted from a helicopter, which had been funded by Mozbio. 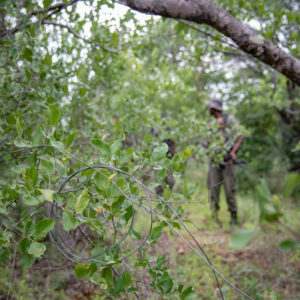 Almeida and his team successfully removed a snare from one of the animals, after which the animals were safely transported by trucks into the reserve and released. The cable was buried in the flesh and tight against the bone causing a massive swelling and infection. It took us 30 minutes to surgically access the cable and cut it out. There will be permanent lesions in leg due to the severity of the injury, however we think that the prognosis its good and that the beautiful buffalo will live a long life in her new and safe home. The translocation brought much needed relief for one of the buffaloes who had a snare cutting into its leg. Here Dr Almeida carefully removes it and dresses the wound. Maputo Special Reserve is a conservation success story. It is well-managed and protected – strengthened by impactful transfrontier cooperation between parks and partners within the Lubombo TFCRA who meet regularly to develop joint development and protection strategies. The Reserve combines coastal lakes, wetlands, swamp forests, grasslands and mangrove forests and has a pristine coastline that supports a wide variety of birds. 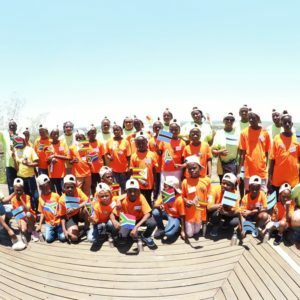 It is quickly developing into a prime tourist destination which will be enhanced with the planned development of new tourism camps within the Reserve, further unlocking economic opportunities for local communities. 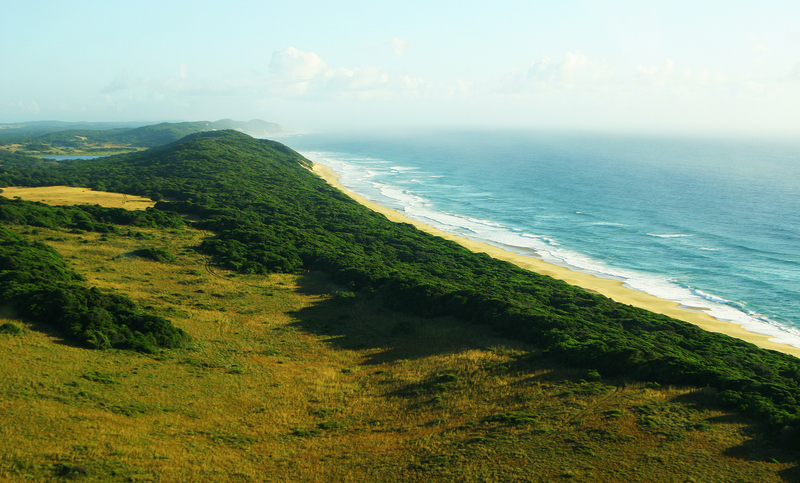 The breathtaking landscapes of Maputo Special Reserve and the adjacent Ponta do Ouro Partial Marine Reserve. Earlier this year Peace Parks Foundation entered into a partnership agreement with the Mozambique Government to jointly develop Maputo Special Reserve and Ponta do Ouro Partial Marine Reserve. 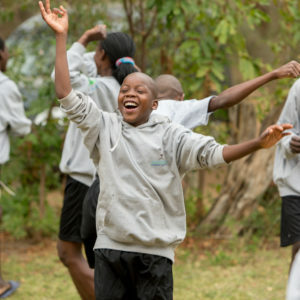 With generous support from the World Bank, Reinet Foundation, Hansjörg Wyss, Neville and Pamela Isdell, and other private donors, Peace Parks Foundation remains committed and invested in assisting the natural environment of Maputo Special Reserve to transform itself back into the paradise it once was.